When you first taste the leaves of the Moringa Oleifera tree, you will notice that the raw, fresh leaves have a tiny "bite" to them. The bite is not as harsh as horseradish. It's not unpleasant, it's just --- there! When the leaves are cooked, that "bite" disappears, and all you taste is the wonderful taste of very distinctive, hearty greens. All Moringa leaves have a very unique aroma, reminiscent of roasted nuts. It is quite unique; hard to mistake for anything else. We just love putting our faces up close, and inhaling that wonderful smell! ALSO KNOWN AS THE "DRUMSTICK TREE" OR THE "HORSERADISH TREE" OR THE "MIRACLE TREE"
For those of you who have never heard of Moringa, at all --- we'll just give you a really quick education on it. Moringa Oleifera is the most commonly known variety of Moringa, and it has been grown in many countries, worldwide for thousands of years. Moringa Oleifera, the variety with which most people are familiar, is a slender tree, loaded with long, delicate-looking branches, which are covered with small, oval-shaped dark green leaves. Those lovely leaves are just packed with healthy, and tasty, nutrients. It is basically a tropical tree, but with care, it can be grown just about anywhere. It does NOT like the cold, so in areas where the temperatures get into the 40's, it needs to be kept warm. When the temperatures average in the low 60's, they tend to lose their leaves, and look a bit sickly. When the temperatures rise, they thrive! Ours made it through several winters here in FL, when the temperatures got as low as 28 degrees F, but we kept them sprinkled with water several times a day, and ran Christmas-type lights up, around and between the rows of seedlings. they put out, and the bushier they get. If you do not prune them, the leaves will be hard to reach. 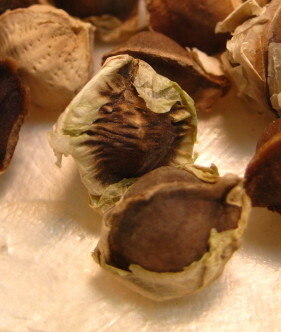 Moringa Oleifera seeds are round and brown with tan "frilled" edges, while the seeds of the Moringa Stenopetala are a light tan, with a shape reminiscent of almonds or pistachios. Click on the bottom box on the right side of the page, to see the differences. It is unusual to see how different the seeds are, for a tree that is still Moringa. The little thumbnail photos above enlarge when you click on them. 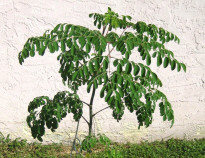 To buy Moringa Oleifera seeds and grow your own Moringa tree, CLICK HERE. tree that I grow into!" Click here to see how we eat Moringa! 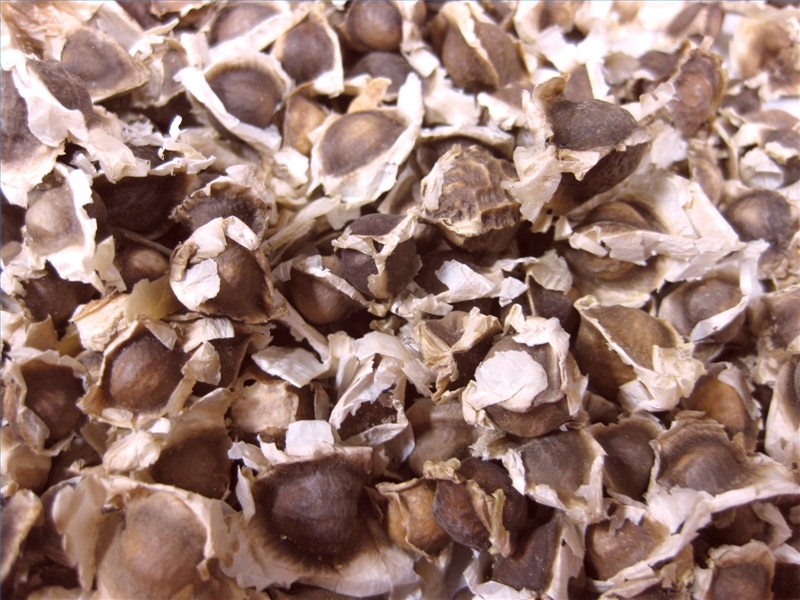 Moringa Stenopetala Seed! This page is about Morey, so I don't have anything to say here!"